Credit for that must go to Austen herself, who packed her novel with enough wit and attitude to make it a pliable piece able to withstand generations of adaptations and bastardizations. If the original work wasn’t as strong as it is, Pride and Prejudice would not have the drawing power it still enjoys 197 years after it was written. It must be daunting to tackle such a revered and well-worn work, but playwrights Joseph Hanreddy and J.R. Sullivan manage to make their version, on display at this year’s Utah Shakespearean Festival, work extremely well. In ditching the narrator and removing the stiff recitations of letters from the book—which other stage adaptations insist on keeping—they’ve created a production that moves smoothly and quickly along, without sacrificing the humor and romance that is its essential appeal. And it’s a testament to both the original and this adaptation that the rapid-fire banter between characters is nearly as engaging as the dialogue in Shakespeare works at the festival. 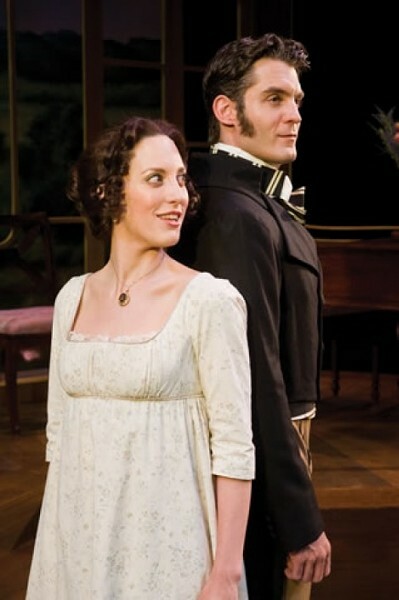 The story naturally evolves through the contentious relationship between Elizabeth (Kate Cook), one of the five unmarried Bennet sisters, and Mr. Darcy (Michael Brusasco); their shift from verbal sparring partners to eventual couplehood was easy to believe thanks to the skilled actors involved. The side characters in the massive cast were just as vital to the show’s success. The pack of Bennet sisters was uniformly excellent, particularly Melinda Pfundstein as Jane, the oldest Bennet sister who, after some Darcy-instigated romantic travails of her own, marries Darcy’s friend Bingley. 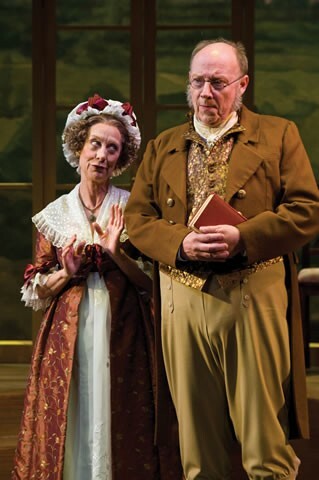 The Bennet parents (pictured below), played by Ellen Crawford and Jeff Steitzer, offer a steady diet of comic relief, she through her manic desire to get her daughters married off, and he via his dismissal of his wife’s concerns and deadpan one-liners. And Brian Vaughn, in the role of bride-seeking clergyman Mr. Collins, infuses his part with a slew of physical and vocal quirks that are hilarious at the same time as indicating the obsequiousness of the character. The sweep of the novel is maintained through quick-changing sets and naturally flowing stage directions; it’s impressive work by director Blake Robison and choreographer Kirsten Sham to move the couple dozen characters around the stage so fluidly. The set itself is impressive as well, the rural countryside backdrop framed as if a mural, abetted by a large rectangle holding doors and windows that appears to further frame the action on stage. These framing devices seemed designed to emphasize Pride and Prejudice as a work of art, and this new adaptation certainly fits that billing. Pride and Prejudice runs through Aug. 28 at the Utah Shakespearean Festival. Visit the USF Website for more information and show times. The festival is hosting a Jane Austen Week from July 19 to July 24, featuring a number of special events including lectures, brunches with the cast and a behind-the-scenes look at the production.